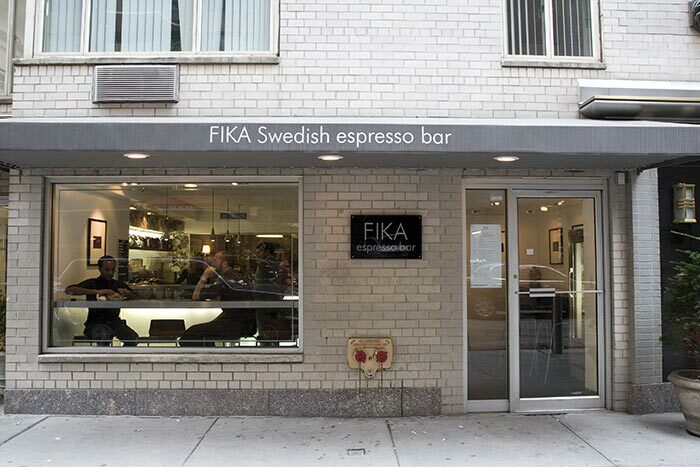 Excited over the hype of the new chain of Swedish cafes in Manhattan, I recently stopped in to “fika” (the Swedish word for a glorified “coffee break”) at the FIKA cafe near the Plaza over the weekend. While I thought the presentation and modern decor were mycket fint, I am ashamed to admit that I was a little disappointed. I think it’s because the word “fika” con-notates a whole other meaning for me. 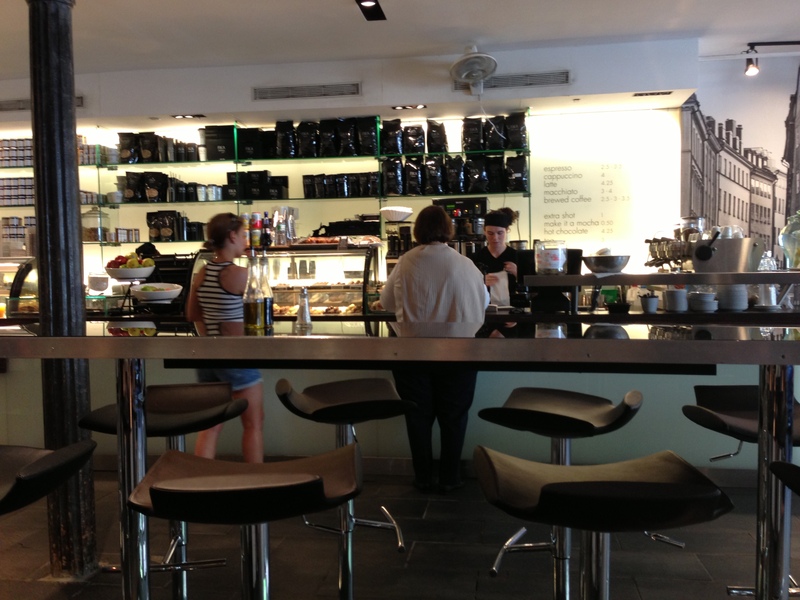 To fika is to take a break from the daily grind and sit in a comfortable chair, sip a hot beverage. converse about life and fill the belly with either a savory or sweet something to tie one over until dinner. But even more than that, it’s never hurried, never done with disposable dishware and never on-the-go. FIKA felt more American than Swedish, in a world of take-away coffee and hard chairs never meant to sit on for over 10 minutes. While you are given a choice to take it to go or sit in for fika, it nonetheless didn’t feel cozy enough to stay and enjoy the ambiance of a true Swedish coffee break. 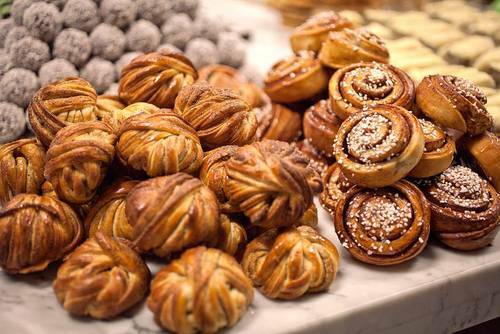 I chose kokosbollar (chocolate balls my daughter often makes), a cardemom bun, lussekatt (saffron bun shaped like a cat) and a smörgåstårt bit (sandwich cake piece). While the over priced coconut balls and cardemom bun were decent, the lussekat was dry and stale. Never a good thing, even when sopped in coffee. But to compensate, the sandwich cake piece was divine, although not so very finely presented. It had a mix of smoked salmon, shrimp, tuna and egg salad, with a little celery for crunch. Very delish, so that made the trip worthwhile. I wanted to try more and they had a menu to offer, but unfortunately, their kitchen and cafe closed early at 5pm on a Saturday! Early for NYC, but I guess about the right time for fika to end. All in all, I was glad to experience it but feel I need to visit more FIKAs to truly give it a fair rating. I have to try their little Princess cake domes, marzipan offerings and chocolate to really know if it’s “The Bomb”. Right now, it feels like it’s at a B-. It just lacks the nice sit-down feel of a cozy Swedish cafe or at least real ceramic mugs so absent in today’s cafes. ← Best Swedish Gifts to Get and Give in Canada! The saffron bun was “alright”, kinda dry, and I demand it moist!